It’s no secret that I am Italian and love to cook Italian. I think that was pretty evident on The American Baking Competition, where even my apron was essentially just the Italian flag draped proudly over this little bambino. But I wasn’t born in Italy. I’m from a unique and lovable area known as South-Western Pennsylvania, just north of Pittsburgh, to be exact. And as far as ‘American-fare’ is concerned, we know how to ‘do it up’ in these parts – from various pierogies to mile-high sandwiches topped with coleslaw and fries, chipped-ham bbq to cookie tables at weddings, we are American, Pennsylvanian, and damn proud of it. Gently place the hard-boiled eggs into a large glass jar with a suitable lid (if you don’t have one, you could split into two glass jars). I suggest using glass because plastic grosses me out and it will also stain. In a large sauce pan, add the sugar, vinegar, salt, cinnamon, and water and bring to a boil, stirring frequently to dissolve sugar. Add the onions and beets (including the syrup/juice in the beet jar), and reduce heat to medium-low. Simmer/low-boil for about 15-20 minutes until onions are tender and pink, the vinegar has reduced slightly, and sugar has completely dissolved. 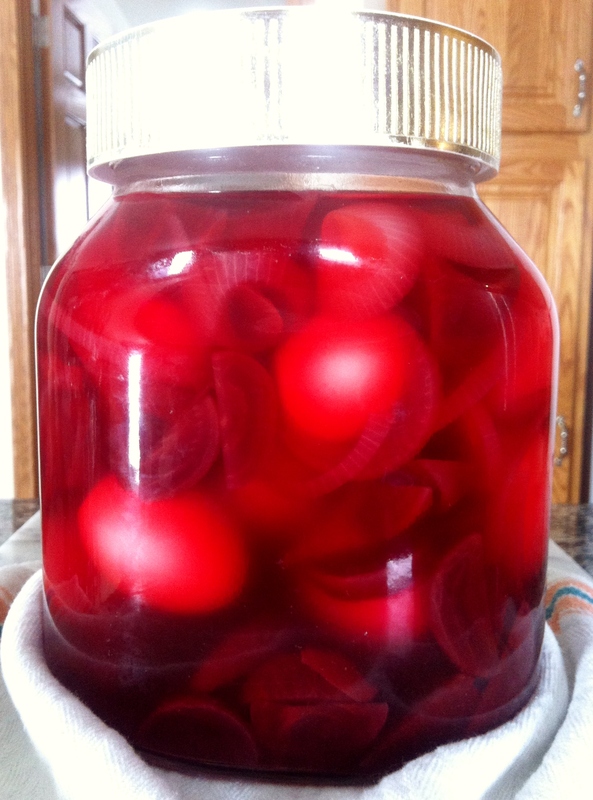 Pour the mixture, onions and beets included, over the eggs in the jar until the liquid almost reaches the top. I do not tighten the lid at this point because it is boiling hot so I just rest it on top. Allow to cool at room temperature before placing into the fridge. Technically, you could eat your first egg after about 5 or 6 hours, but I strongly suggest giving it a couple days. These store beautifully and only get better each day for a maximum 2 to 2 1/2 weeks (refrigerated). 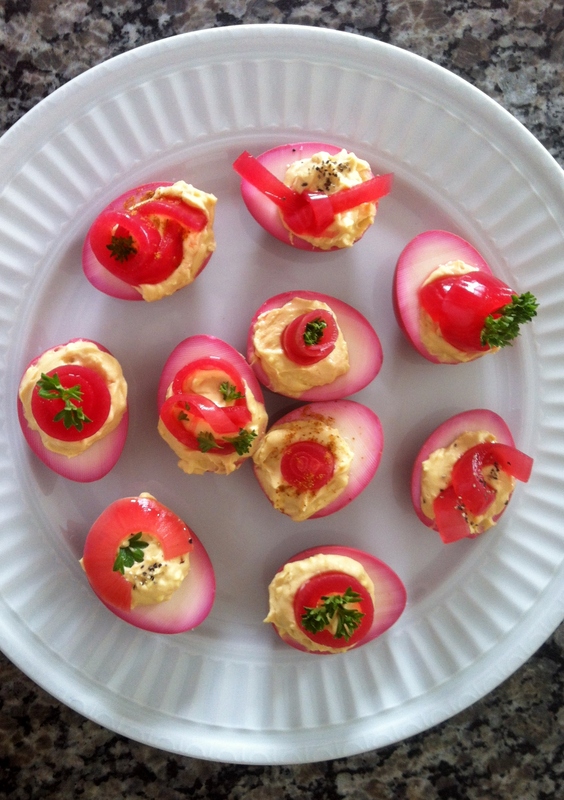 Now for the fun part…deviled eggs. 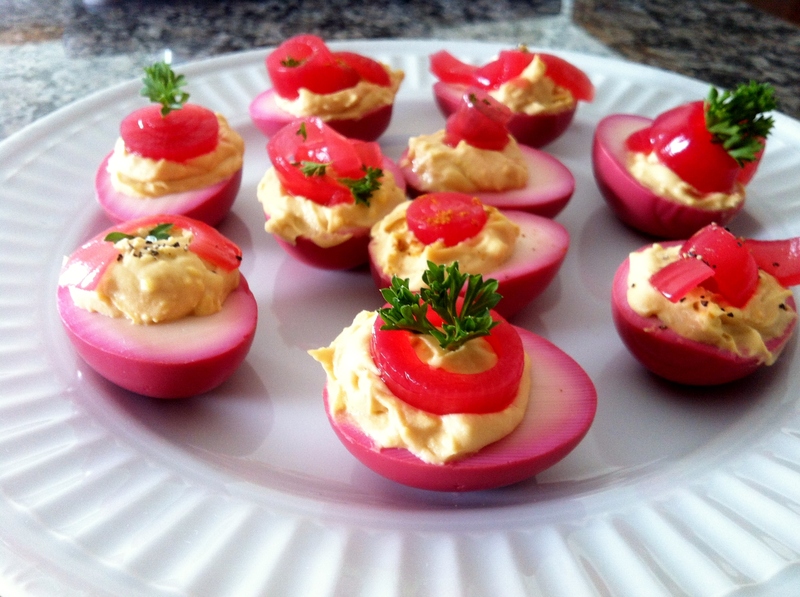 I only first tried this the other day when my pickled gems were ready to eat. I sliced them in half, and very simply, just emulsified the yolks with several heaping tablespoons of Miracle Whip. That’s it. I like using Miracle Whip over Mayo because it has a nice sweetness to it. 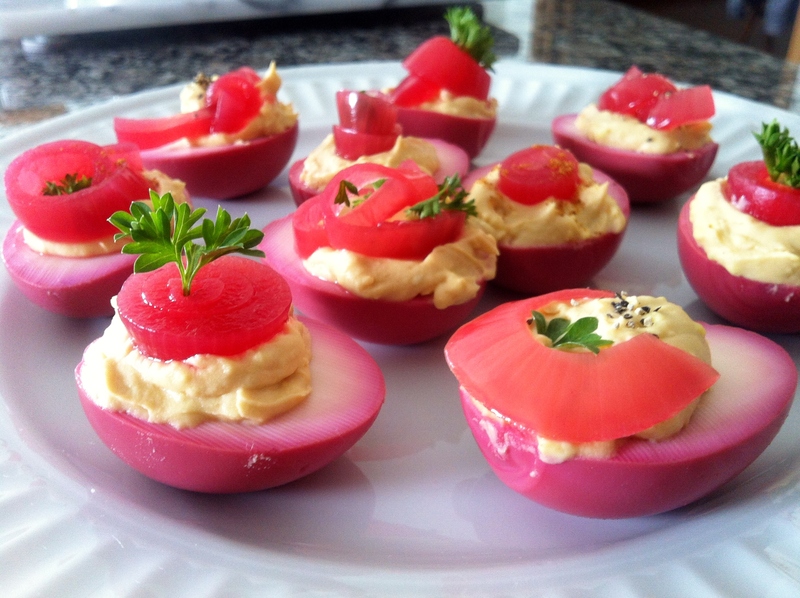 You can use your favorite deviled egg recipe for the filling. 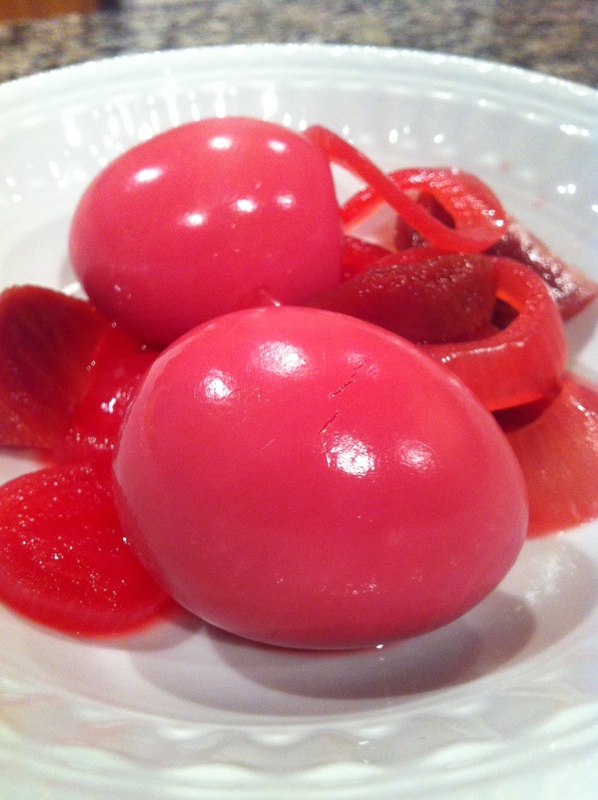 Once the mixture was creamy and semi-smooth, I spooned a dollop into each egg, then garnished with a pickled onion arranged in a fun, artistic way. On some I sprinkled cracked black pepper, others paprika, and on several, fresh parsley to garnish. I’m so inspired for my next batch – for example, adding crispy bacon and crumbled blue cheese to the filling or perhaps walnut and shredded cheddar. The possibilities are endless. I’m out of eggs, so I have to repeat the entire process over again before attempting any bold combinations. Oooh, jalepeno and something else…any suggestions? BUON APETITO! Or as we say in Pittsburgh (not a translation of buon apetito) Djeeeetyet?!? !